Creating for Sheer Joy Sake! Try making some fun cards! Life is too short. So let's take some time out to enjoy ourselves. These are handmade cards created solely for the sheer joy of creating. In our busy schedule, it is good to relax at the end of the day or week just to have some fun and 'me' time simply creating. Why not spend some time to create some fun greeting cards for kids or adults; for just anyone. Let them know that life can be fun, funny and enjoyable too. Better still, invite them to create cards with you. Making handmade cards for the sheer joy of creating using various fun techniques is the best playtime for families to spend quality time together. Make sure to scroll to the bottom for more fun cards. 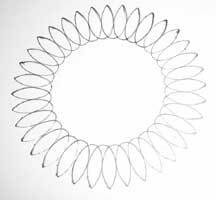 I have always been a kid at heart where spirographs are concerned. Love it so much that I will draw spirograph patterns all over my journals, altered books, and greeting cards. You can have hours of fun just making these spirograph designs. 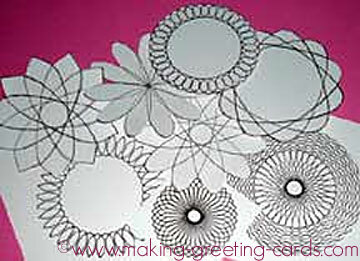 Design with the spirograph set on white cardstock. Color them with metallic gel pens, cut them out and just paste into your cards. Lovely! Try it! Here are a few of my Spirograph Cards. A 3D butterfly resting on the centre of a spirograph flower. 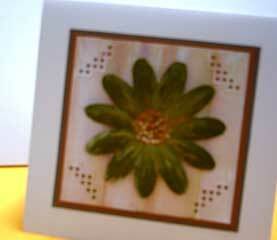 Corner punch is also used on this handmade square card. You can read how I create this card here. 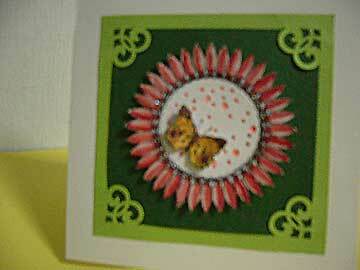 This fun card is also done using a spirograph design - another flower. Colouring the design with acrylic paint and then cutting it out to layer it on coloured papers. 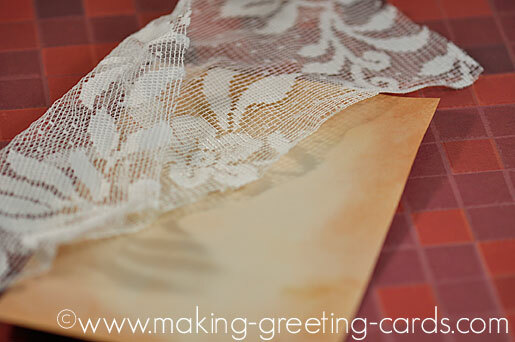 And finally attaching to a square off-white basic blank card. Here, I also used a photo corner punch to decorate the four corners. 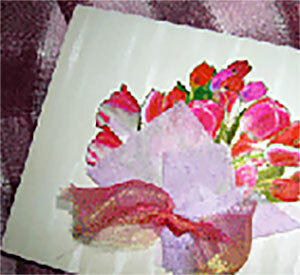 Card made with bright and colourful tulip stickers. 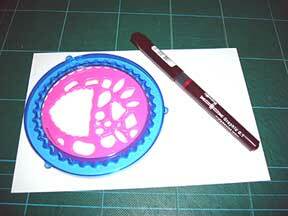 Draw a spirograph flower design on the small white card. Paint with red watercolour on the petals. Cut out the flower, slit deep in between the petals. Punch holes in the centre of the flower. Number the petals on the back from 1 to the last petal. 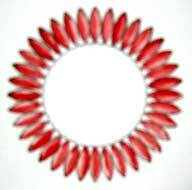 Wind the thread from petal 1 to 5, then 5 to 2, 2 to 6, 6 to 3 and so on till you reach the last petal. Tape the thread to the back. Punch the corner of evergreen colour card with the photo-corner punch. Slip the dark green card into the corners like a photo. Paste flower image on the orange round paper. Layer it on the green card. Attach to the white basic blank card. Stamp a butterfly image with black pigment ink. Colour it with yellow, orange and brown watercolours. Cut it out and attach to the centre of flower with foam tape. Voila! Your spirograph card! Stripe Swap Card - This is a card I made for an online swap with the Stripes theme. Card Challenge Cards - Here are all the fun handmade cards from the card challenge.